Please Note: If you are viewing this page in a news feeder, the images may get munged up a bit or other formatting of the posting may fail. For the best experience, please visit the journal directly by clicking (here). As you know, you can setup a FileMaker file to open automatically with a default account name and password. I wouldn’t recommend this in a large and complex solution because every user should have a unique account name and password for security and tracking reasons. Anyway, don’t forget how to bypass the default account! 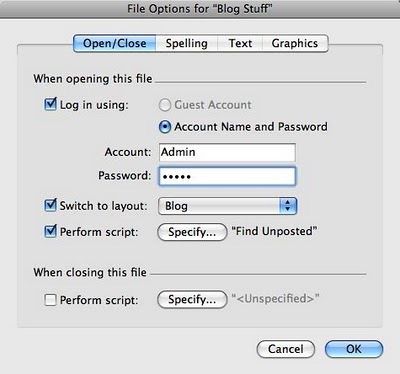 On a Macintosh computer, bypassing the default account can be done by holding down the Option key while opening the file. On a Windows computer, bypassing the default account can be done by holding down the Shift key while opening the file. Here is the friendly reminder that FileMaker gives you when you first setup a default account / password. Oh, you don't see the icon for the Futurama character of Nibbler in the default dialog box. I tend to have multiple versions of FileMaker running on my main machine and give each one the icon of a Futurama character to tell them apart. Nibbler is my FileMaker 9 Advanced copy I picked up from last years FileMaker Developers Conference. Now that we have discussed how to setup a default account, we should tell you why you may want to bypass it. When a database is set to open via a default account, everyone has the exact same access. It makes no sense to have the default account be the master account because that would be the same as no security at all. So the default account is almost always a lower level than full access. So as a developer, you will need to log in at full access from time to time to make design level changes. So you will need to bypass the default account system long enough for you to enter the database via the master account setting. There is at least two ways to bypass a default account. The first is to hold down the option key (Macintosh) or the shift key (Windows) when you first open the file. This will bypass the default account and bring up the account credential dialog box. You can then enter in the account/password for the access level you have. The other way leverages off of FileMaker's built in system of opening a database from another database with the same account. In this instance you can make a launcher database that has a script that opens the target database. Here are the steps for creating the launcher. - Create a new database called launcher. You don't need any fields for it. - Put in the new account/password that you want to open the other database with. You may choose to make this account setting the default one for the launcher file or you may not. - Write a script that opens the other database (the one with the default account you don't want to use) Call the script "Open Target DB", for example. The first script step is to open the target database and you will find the open script step towards the bottom on the list in the Files area. - Choose the open script step and specify it to open your target database. - Choose the close script step and specify it to close your launcher file. What will happen when the script is run is that this database will open the other database and then it will close itself. We will make this script run automatically when the database is opened.